By Hazel Chua on 12/12/13 • Leave a comment! Where I’m from, the older generation advises the younger ones who have asthma to drink the soup (if you can call it that) that’s obtained from boiling dried flying lizards in water. Apparently, it can get rid of the wheezing for good. I’m asthmatic, but I’d rather go for my inhaler than a bowl of flying lizard soup any time of day. Homemade cures and tonics often make use of unusual and sometimes disgusting ingredients. Take the case of this cure-all that many speculate to be of Chinese origin. It’s wine with actual dead baby mice in it. It’s said to be a cure for a variety of diseases, including liver disease and asthma. Preparation sounds relatively simple: drown a dozen or so baby mice (maximum age is three days old) into a bottle of rice wine, and leave it for 12 to 14 months. As for its taste, people who’ve tried it report that it tastes like gasoline. Baby mice rice wine: Drink at your own risk. By David Ponce on 04/18/13 • Leave a comment! 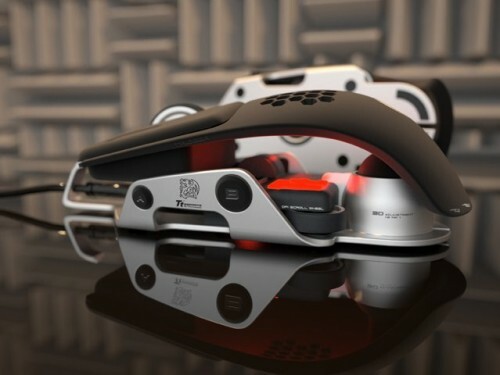 Last time we were impressed by a gaming mouse, it was because it has a cooling fan attached to it. 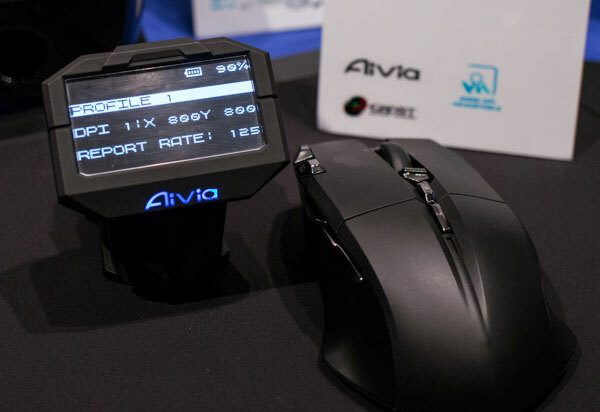 This mouse from Gigabyte, the Aivia Uranium, comes with a sidekick LCD screen. It has an integrated OLED monochrome display to clearly show how far along in the recharging cycle a power pack is. It also shows the current DPI setting of the Uranium and its current wireless frequency. You can even customize the macros, as this is where the onboard memory for the Uranium is stored. By offloading as much as they could from the mouse to the station, Gigabyte’s claim of 70 hours of wireless use does seem much more plausible. There’s no word on price, but it should be available in June. We would like to believe that the above picture is that of a real product. Not because we think there really is a benefit to having a levitating computer mouse, despite claims of it relieving stress that leads to Carpal Tunnel Syndrome. 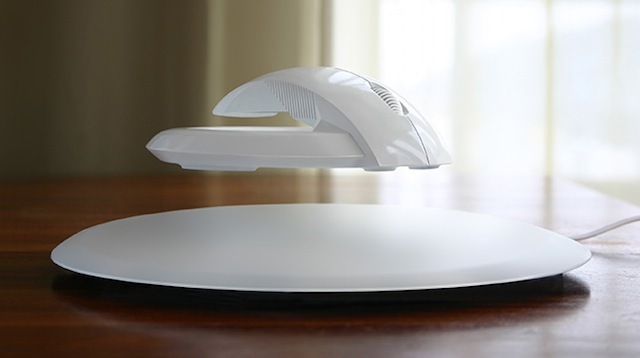 But because, really… a levitating mouse?! The Bat, as it’s called, allegedly floats all by itself at 40mm when not in use, and comes back down to 10mm beneath the weight of your 1000g (~2.2-pound) hand. You use it as you would a regular mouse, and… yeah that’s it. It’s a project by Kibardin Design and it’s supposedly under testing at the moment. We’re not holding our breaths to ever see it on the market. It reminds us of Art Lebedev’s fabled Optimus Maximus Keyboard, which took the world by storm in early 2005, only to later be pulled, prodded and kicked into a workable product, albeit at a ridiculous price and produced for a very limited time. Hit the jump for one more pic. By David Ponce on 07/06/12 • Leave a comment! Gaming is serious business and innovation is what keeps the market constantly hungry for more… even if the products it spits out do look a little silly. The above Black Element Gaming Mouse, Cyclone Edition, by Thermaltake, features a little fan to cool your hand and prevent sweaty… top of hand. Yeah… It might not actually do much for cooling the part of your hand that needs it most, but hey, it sure looks interesting. Plus the mouse has removable weights so you can adjust that to your taste, by as much as 22.5g. The fan is a 30mm design that operates at up to 6,000 RPM. The reported noise level is a whisper-quiet 21.7 dB. That’s about the same as leaves brushing along the ground. Thermaltake reports it has a lifespan of 50,000 hours, or about 6 years. 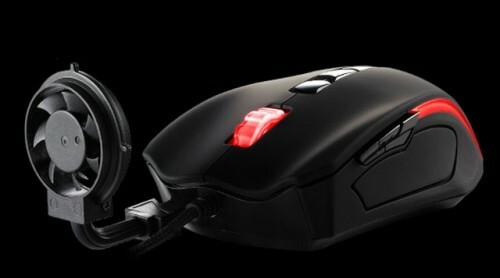 The mouse itself has a customizable laser DPI engine of 100-6500 DPI. It has nine macro keys with five different macro profiles, for up to 45 individual macros. It isn’t wireless however, as the fan would likely shorten battery life too much. The fan itself plugs into a USB port in the front of the mouse and is removable. The fan however doesn’t light up. One of the coolest features of the mouse though is it’s customizable weight. That’s right, you can change how heavy it is, up to 22.5 grams, depending on your needs. That’s a pretty serious gaming mouse. We’re not sure when it’ll be available but the price is rumoured to be in the $100-$130 range. By David Ponce on 01/17/12 • Leave a comment! There’s no accounting for taste, they say. And that may be the reason BMW Group subsidiary DesignworksUSA decided to partner up with Thermaltake to produce what you see above. 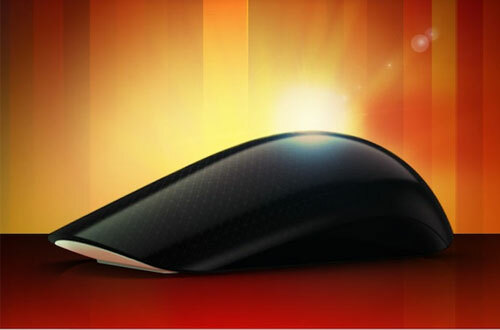 It’s a mouse, and it’s called the Level 10 M gaming mouse. M… I think as in BMW dared use the M nomenclature on a mouse. In my eyes it looks incredibly contrived and needlessly complex, although again, I’m sure there are those who will go “gee-whiz, that’s a fine looking mouse, yes sir-e-bob”! And that’s ok, let me just stick to the facts. For one, the upper plate is height and angle adjustable through the turn of a knob. It’s also perforated, to tackle sweaty palms. It’s going to be released this spring, but there’s no word on price. Logitech G300 Gaming Mouse Reviewed. Verdict: Left Handed Home Run. By Ian Chiu on 11/07/11 • Leave a comment! The market for gaming mice is very healthy these days. Anyone making gaming devices, wishing to garner more than a sliver of purchases from the gaming world at large has to do something pretty amazing, or do something subtle really well. 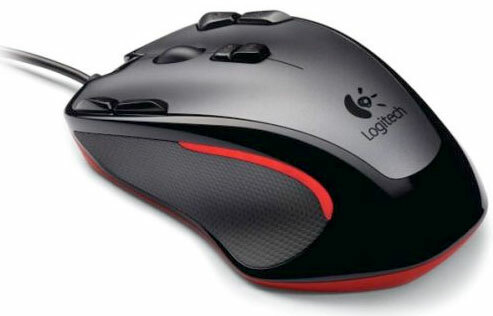 Logitech has tackled the latter with their latest G300. The gaming mouse doesn’t have an excessive amount of buttons or an obscene amount of DPI resolution or wildly adjustable parts. What it does have is class and the ability to suit both left and right handed players without looking like a cybernetic monstrosity. “Less is more” doesn’t do the G300 justice as they do more with less, better than most competitors do with “way too much”. 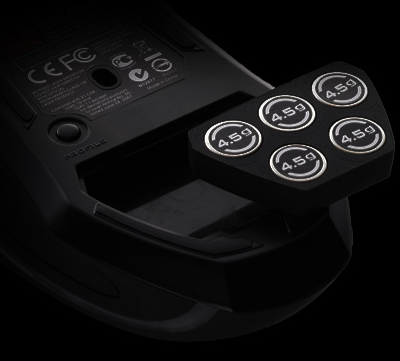 The G300 sports 9 programmable buttons, much more than can usually be supported by ambidextrous enabled devices, and doesn’t waste time on excessive programming support. Many of us gamers getting into our golden years don’t have the time or the patience to deal with tweaking to that level. Maybe it does it more justice to call this a mature mouse than an unsophisticated one. It has clean lines and an almost too narrow body that help fingers easily locate all the buttons. The G300 does add an uncharacteristically gamer-ish backlighting which is giving more sway to the Razer style that Logitech normally does. The only other ‘tamed’ feature that might actually be missed is the 1990’s era scroll wheel. By Chris Scott Barr on 10/27/11 • Leave a comment! Everyone knows that clowns like to have oversized accessories. I mean, just look at their shoes, or ties. It kind of makes you wonder whether or not they have other oversized things at home. I like to think that this Giant USB Mouse from Brando is what every clown uses when they’re working on the computer. 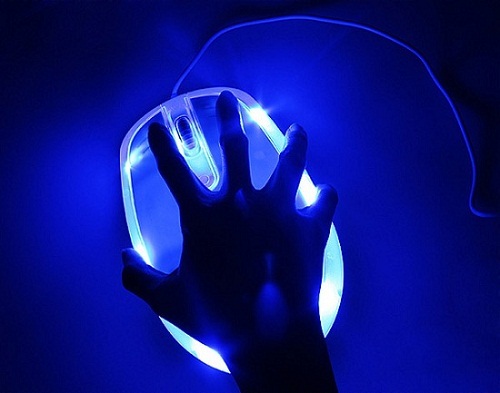 Take away the glowing LEDs and the fact that you could easily operate it with two hands, and you have yourself a plain old boring wired mouse. But when it’s that big, do you really need it to do anything else to justify the $20 price tag? I think not. By David Ponce on 10/11/11 • Leave a comment! Researchers at the Tokyo Metropolitan University have developed a method for determining stress levels that can fit inside a computer mouse. It uses a pulse-wave sensor to measure bloodflow in the fingertip by bouncing infrared light off your flesh and analyzing the variations. And while bloodflow itself is not a marker of stress (certain hormone levels are), the researchers have found a correlation between the stability in your cardiac rhythm and these hormone levels, 70% of the time. Of course this begs the question of why anyone would want to know how stressed they are, not to mention that any given person is likely already aware of their stress levels without a device having to tell them. At least that’s what you’d like to think, but the truth is that we really don’t pay that much attention. We trudge through our days rarely making an effort to manage our stress. This device could help harness the power of feedback loops, much like newer street signs showing you your actual speed (even though you can easily glance at your speedometer) have proven to be effective at slowing motorists down. We can envision a program that constantly monitors you and flashes a warning sign when it’s time to cool off. The entertainment value of such a system of course would pale in comparison with the fun to be had watching your cubicle neighbor finally lose it in a fit of keyboard smashing melodrama. By Ian Chiu on 09/27/11 • Leave a comment! Presumably in response to the Apple Magic Mouse which mates a multi-touch touchpad to the top surface of a desktop mouse, we now have access to Microsoft’s take on the idea. The almost all-terrain BluTrack laser is heart of the Microsoft Touch Mouse and its performance isn’t in question. The BluTrack system is a proven performer on just about any surface and only sips on batteries delivering long life. The top of the mouse, from the button area to the rear palm-swell are all touch sensitive. With two thirds of the mouse being touch sensitive, Redmond has delivered a handful (pun-intended) of gestures to leave that old school, mechanical, 3 button number in the dust. The gestures are enabled by software, which are currently only available for Windows 7. They are not currently highly configurable but that may change over time. There are only about 10 available gestures including single finger scrolling and a clever forward/backward thumb control. Custom gestures are not currently on the road map for this device but software upgrades and later models may evolve to this function. Only recently available to consumers, previous impressions were from brief exposures at trade shows and have been mixed. While many have been ready for the touch enabled surface, many are hesitant once they feel the absence of tactile buttons. For a more thorough review of how it fared after prolonged use surf over to Everything USB.